Last week after lunch with Hazel's best friend and his mother, the four of us went over to Lakeshore Learning Store. 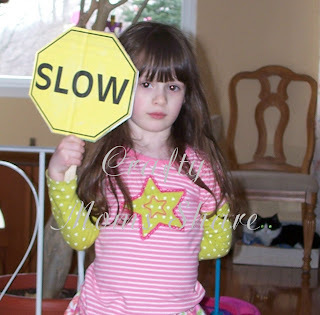 Hazel's friend really wanted a toy stop / slow sign. His mother really did not want to spend the $10 on it. I tried to convince him we could make one at my house when we got there, but he really wanted that one. She bought it for him. Hazel did not ask since she heard it was expensive and we could make one. We came home and made one for Hazel after they left. To make it, I printed out an octagon sign with STOP and an octagon sign with SLOW (similar to the toy and not the traffic ones). Then we glued them to scrap cardboard. We let the glue dry. Here is my Word Document of the sign. 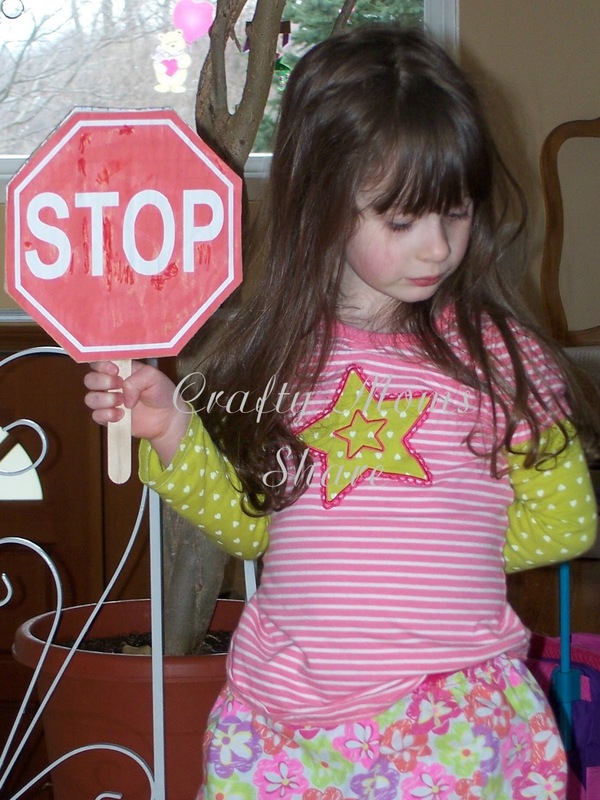 Then we taped a tongue depressor to the back of the signs and glued the signs together. We placed them under our dictionary but any large, heavy book will work to let the glue dry. I wanted to seal it in clear Contact paper, but I need to buy some and she wanted to play with it right away. Of course it hasn't come back out since the first day, but at least I didn't spend $10 on it and made hers for free. Great "thrifty" idea!! Thanks for sharing with us at Eco-Kids Tuesday! Hope to see you again tomorrow!